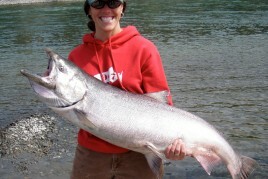 Experience the one and only Kenai Wildlife Refuge with world class salmon, trout and scenery. We use only top of the line comfortable and spacious, 20 Foot Drift Boats on our fishing trips. 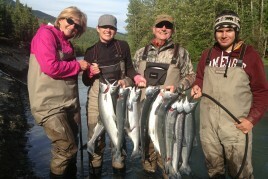 Alaska Salmon Guide’s offers guided Alaska Fishing Trips, fishing the Kenai & Kasilof Rivers for Salmon, Trophy Rainbow Trout, Dolly Varden and Arctic Char. The Kenai River is the best river in the world that you can drive to. Enjoy a drift boat fishing trip down the river that you will never forget. The secret to extraordinary Trout Fishing in Alaska is to follow the salmon. The salmon fishing is very good on the Kenai River, but the trout fishing is World Class. The salmon are spawning and the trout are gorging on the eggs and flesh. August 15 to October 15 the river is on fire for trout fishing. The river holds Rainbows, Dolly Varden and Arctic Char. In the late fall Steelhead show up as well. During this time we catch unbelievable amounts of trout. The average size is 2 to 3 pounds and you have the chance at a 30 inch rainbow. Chase the salmon and hook that monster trout of a lifetime. Rainbows, Dolly Varden, Char and both runs of Reds and Silvers. Red and Silver Salmon, Rainbow Trout and Arctic Char. Silver Salmon and the mighty Alaska King Salmon. 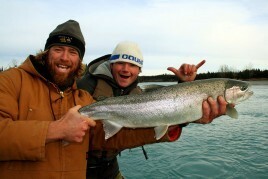 On a trip with Alaska Salmon Guide's, our experienced guides will make sure you have the fishing trip of a lifetime. We use only the best equipment, from our 20ft drift boats to top of the line rods, reels, waders and boots. 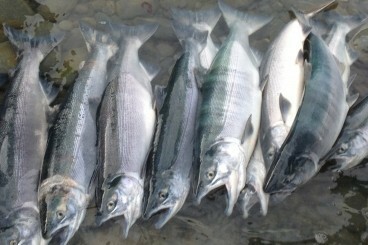 Trout and Salmon are found in abundance in Alaska's Kenai and Kasilof Rivers. Unbeatable fishing you will never forget. "Best guide ervice in Alaska. Spent 4 days with these guys, and they are, by far, the best guides I have ever used. Enthusiastic, hardworking, and extremely skilled. The best week of fly fishing I have ever had." "Our first trip to Alaska and the Kenai River were "Brilliant" we booked a fishing trip with Alaska Salmon Guide's and our day with Tige was outstanding. He was a great teacher and mentor and took safety to the fullest. 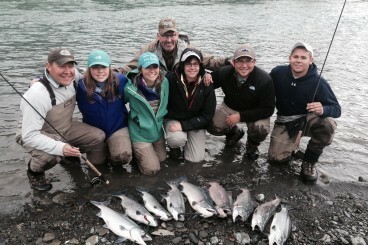 Tige put us on the Sockeye Salmon for 2 full wonderful days on the Kenai River. Tight lines ." "What a place to visit. Pristine, mountains, rivers and wildlife. This was are first time fishing ever. Fishing with Alaska Salmon Guide's was nothing but top of the line. 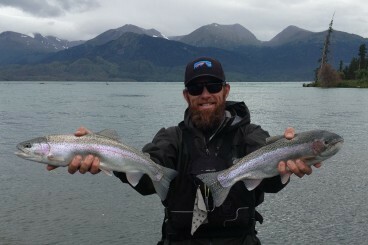 Jason showed us how to catch world class Rainbow Trout and Dolly Varden. We saw several Eagles and 2 brown bears. We will be back very soon."